So Delhi was a lovely, yet short visit for me. Nevertheless, as always when I travel, I managed to pack in a great deal. 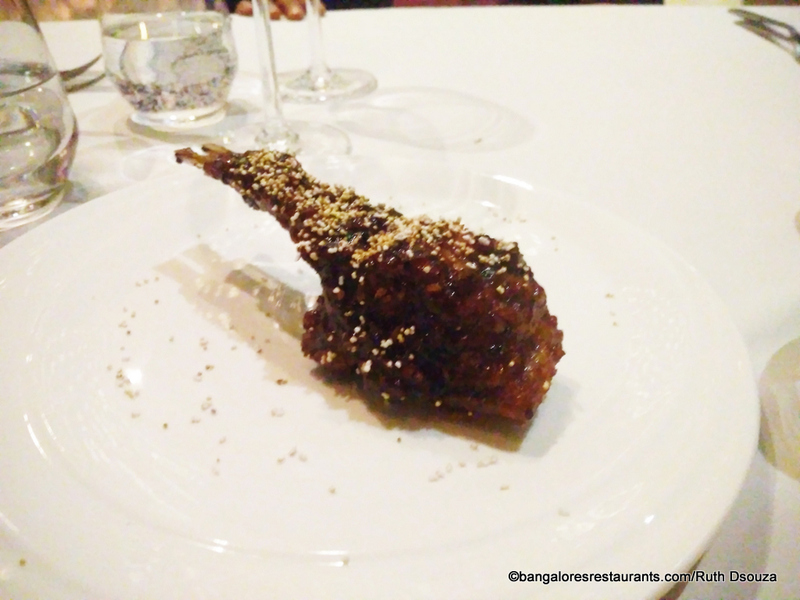 An amazing culinary experience was at the Masala Library by Jiggs Kalra. I was invited to experience having all of India served onto my plate and believe me it was an experience that I will cherish for a long time. Masala Library has a very elegant entryway, flanked by greenery, leading up to glass sliding doors. Stepping in, you see a beautiful Enoteca which forms the backdrop of the bar. A massive oval chandelier dominates the dining room and an banister-free staircase takes your eyes to a wall of wine bottles. We were seated right next to the bar and Karan was our host for the evening. One of the first things he told us about the 19 course degustation menu we were going to experience was that it was truly representative of the whole country. He asked us to sit back, relax and enjoy every course as it came by. I opted to go the wine paired way and this meal has six wonderful wines that are paired with it. PS: Though I carried my DSLR with me, the mood lighting of the space did not allow me to do justice to the meal. My phone took better images and most of which you see here are from it. They aren't how I would like to show them to you, but I am hoping my words make up for what my pictures lack. 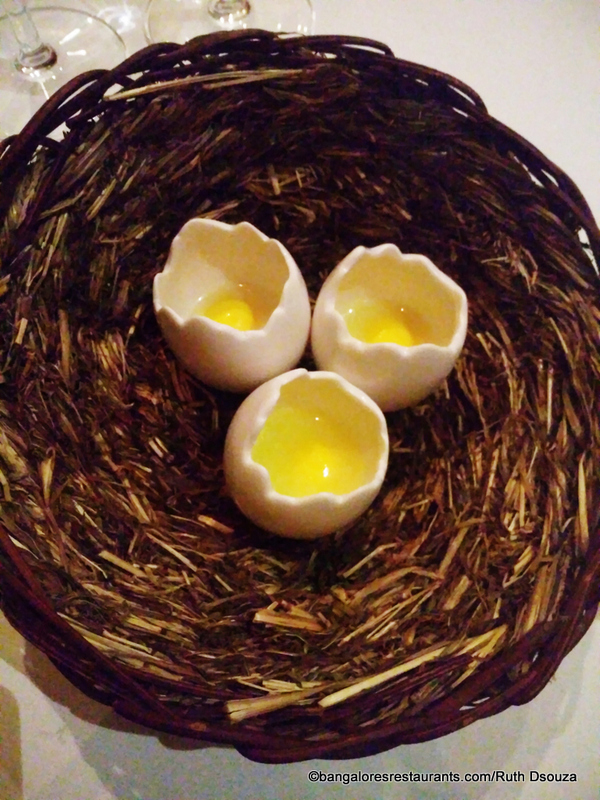 We begin the journey with an Amuse Bouche called the Fake Egg - as the name suggests, what you see may look like a soft boiled egg in a cracked shell. 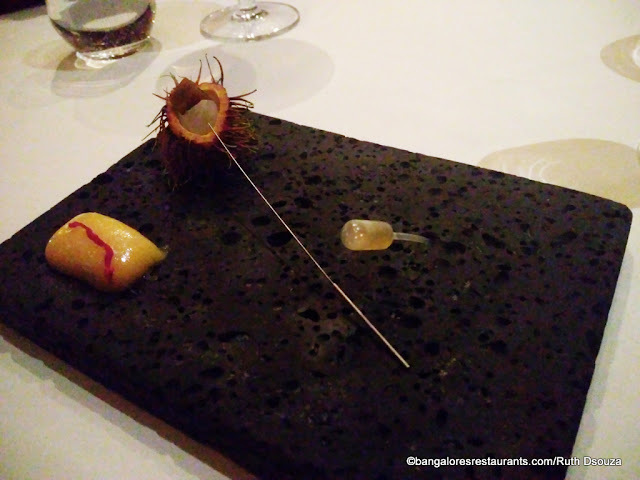 The shell is a ceramic holder which holds a spherification of mango in coconut water. Definitely not a combination you will expect. You are instructed to pick up the 'egg' container and shoot in one go. The coconut water buoys the mango for a short bit before it bursts in your mouth, into a mouthful of lovely mango. A very interesting way to begin the meal. 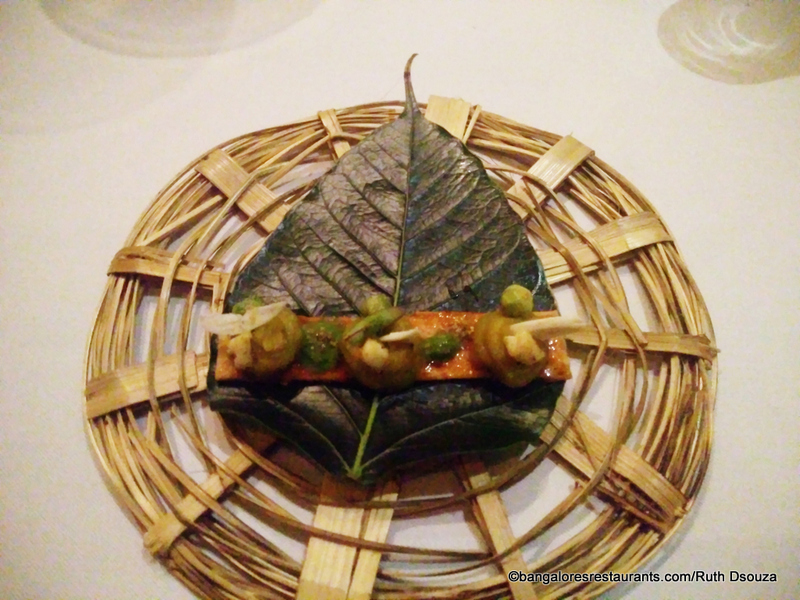 The next series of dishes that came to the table were titled Snacks and were accompanied with Kumala Chardonnay from South Africa 2014. First out, representative of South was the Maddur Vada with Clear Lemon Rasam. Of course what you see here is definitely not the dish in the classic sense. The Maddur (though I personally felt it tasted more Medu Vada than Maddur Vada is a small, crispy orb over which is piped tomato chutney with a curry leaf tadka. 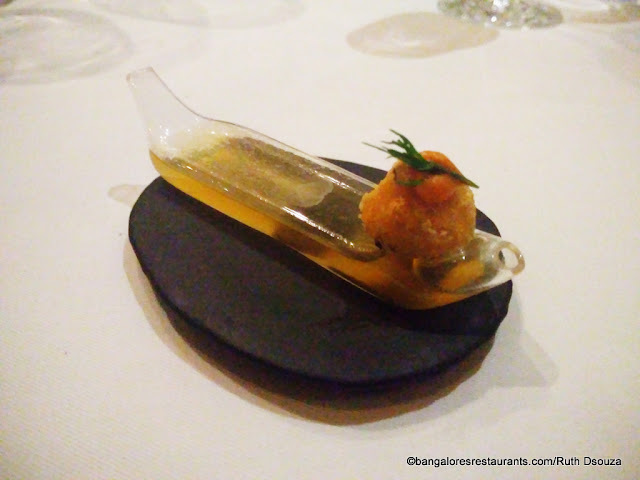 This is place over a pipette that holds a consomme rendition of the lemon rasam. Karan tells us to pop the vada into our mouths and then hold the pipette to our mouth and gulp. The lemon rasam has all the flavour of a good rasam, right down to the hing tadka, yet it appears clear. Quite a feat achieved. The next course took us to Goa and has Goan Pirada (perad as you might know it), lychee, Manchengo Cheese Poee (Pui Bread that Goa is famous for). Placed in the shell of the Rambutan is a lychee perad. The Manchengo pui has a sliver of dehydrated beet run through it. 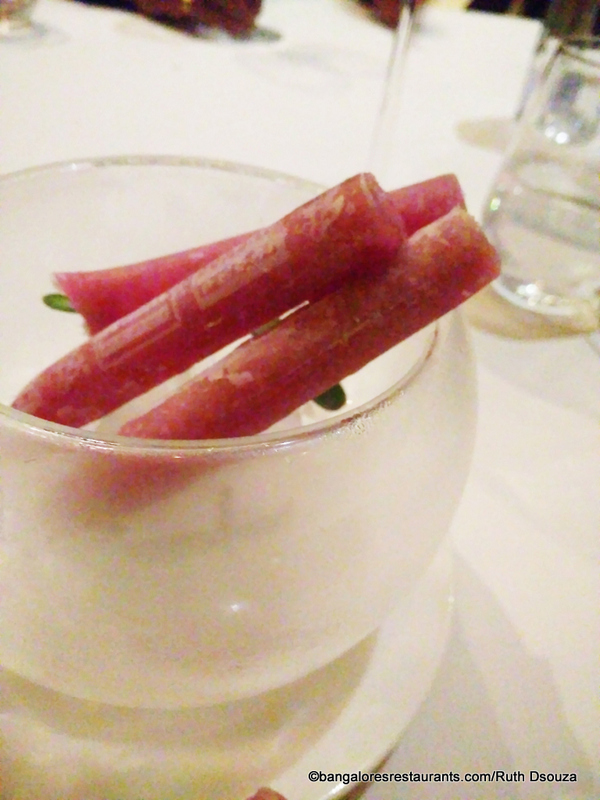 A mouthful of the perad, a squeeze of the lychee juice on it and then the bread. What happens is that you have a melange of textures in your mouth - from a crisp exterior of the perad, giving way to chewy fruit flavours to the heavier bread that is mushy to the touch but packed with great taste. Next up was the Deconstructed Samosa - a baked base, with aloo puree, green chutney, peas, carrot puree and tamarind chutney. Each element was piled to create a delicate mound atop the base so that you have three perfect bites. What was very interesting was the fact that you get the experience of eating of samosa, yet what you see in front of you does not remotely look so. 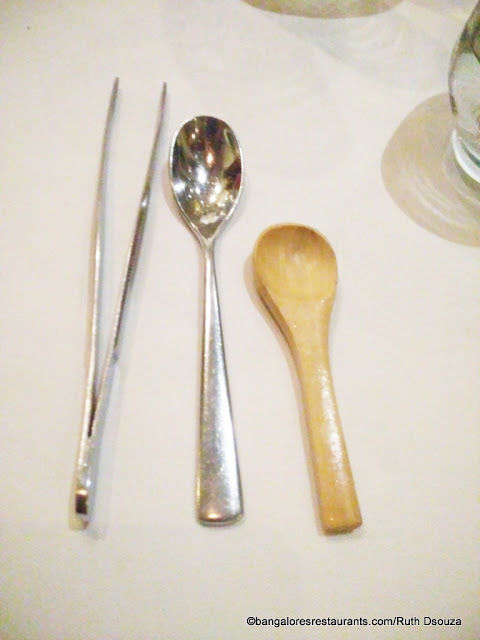 How often do you see cutlery of this nature come to the table? 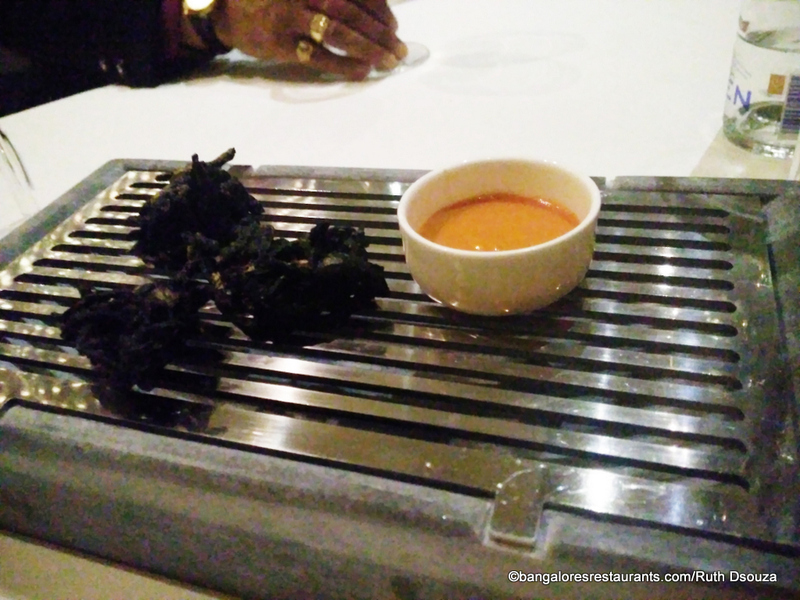 Next up was the Activated Charcoal Onion Bajiya with a bellpepper dip. Now this is the first time I was having something that had activated charcoal as, well, an active ingredient. 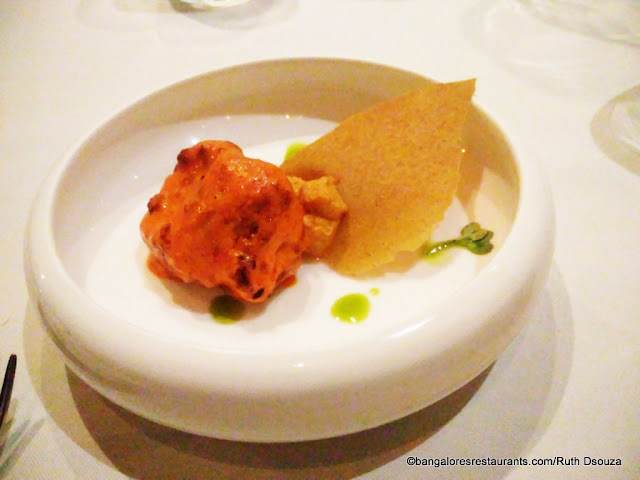 The bajiya, in terms of texture tastes just the way it should, crispy, searing hot exteriors, giving way to fried onion insides that had its flavour accentuated with the bellpepper dip. The activated charcoal gives it a lovely roasted flavour but that would be putting it mildly. The roastiness goes quite deep and in a good sort of way. 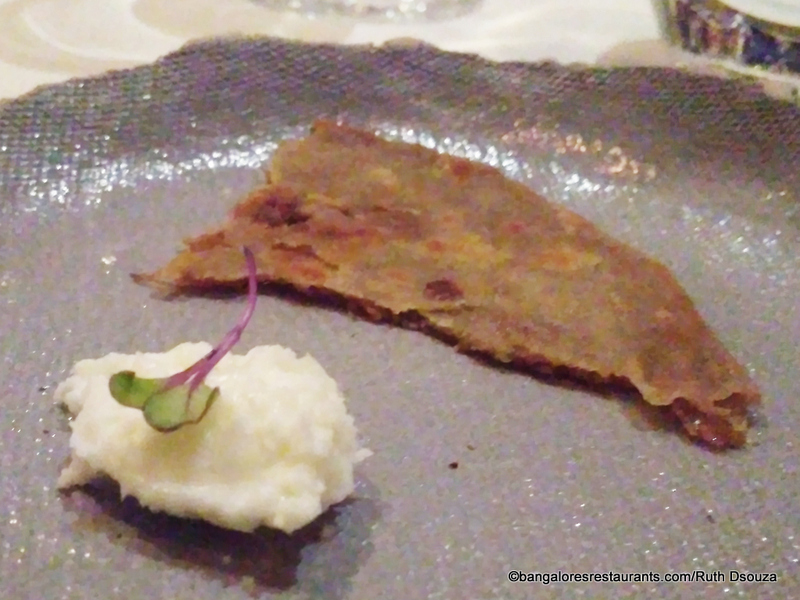 The next course is a Tribute to the farmers, particularly the Punjabi region, with a piece of Bajre ka Roti and house churned butter. This dish is the perfect showcase of how rustic Indian khaana can steal your heart away no matter whether you are sitting under a tree in your farm on a blazing afternoon or in the airconditioned, upscale environs of the Capital's best! This heralded the end of the snacks. The next course was served with the Cosecha Tarapaca, Merlot, Chilean wine. Got to hand it to the sommelier, she does a top notch job. The highlight of the meal, for me personally is the (though by the end of the meal I will have mentioned "highlight of the meal" a few times more. This Mushroom chai is a tribute to the chai that is so widely enjoyed across the country. 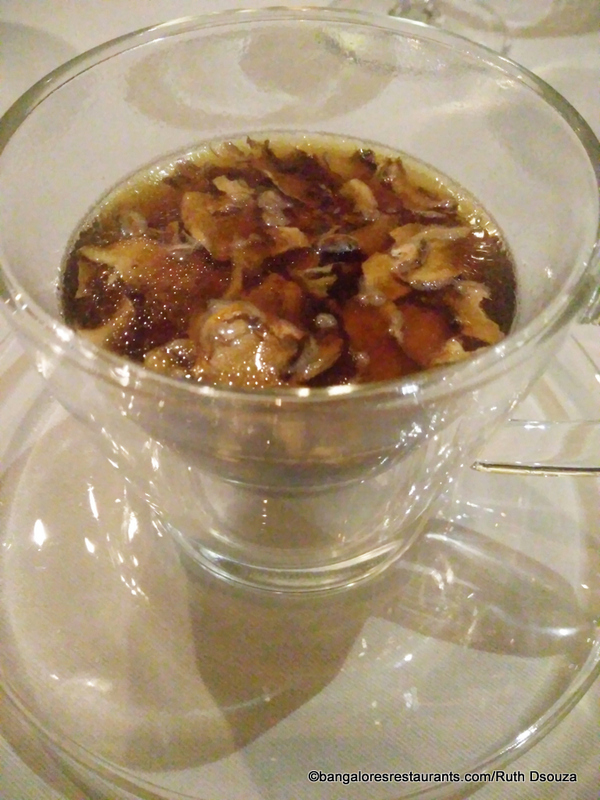 A variety of mushrooms are dehydrated and placed in a chai cup. Over this is added a generous spoonful or two of truffle powder (representative of dairy). And then is poured a mushroom consomme. It is all stirred gently together and then you sip on it. It is the stuff that late night cravings are made of... or as the case may be... anytime cravings. Reams of paper and millions of bytes on the Internet have been dedicated to the Galouti Kebab. The rendition here definitely does not look like a galouti, though it is placed over a delicate sheermal. What you see a distinct swirls of meat that have bee piped through a piston over sheermal, giving it a distinct stringy look, but push your fork through and that soft feel of a good galouti is what you get. 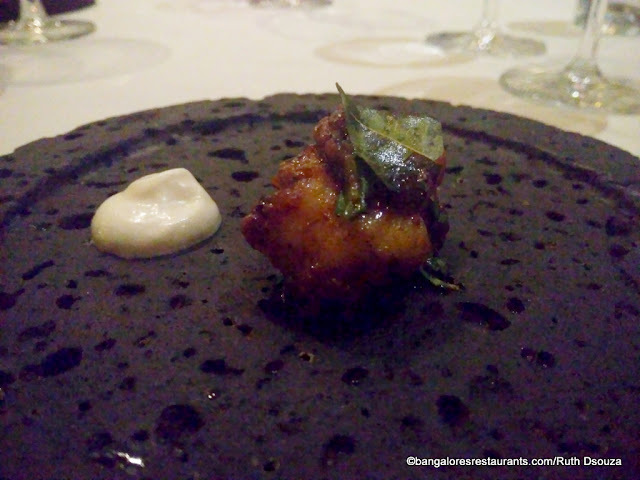 An ode to Tamil Nadu is the Curry leaf Tadka Pepper Prawn with Thayir Sadam. The prawn is a generously sized one, with a glaze of pepper and tempering of curry leaf, making it irresistible instantly. The heat of the prawn is instantly caressed away with the spot of pureed curd rice - a slightly grainy texture, which adds some wonderfully to the picture in your mind of classic thayir sadam - mustard seeds-curry patta-hing tadka and all. Now this was a dish that took a while to wrap my head around. The Chicken Tikka Cubed - It is served up in the classic form, a whole morsel, steeped in curd, chilli, ginger garlic and garam masala marinade and then placed in the tandoor. 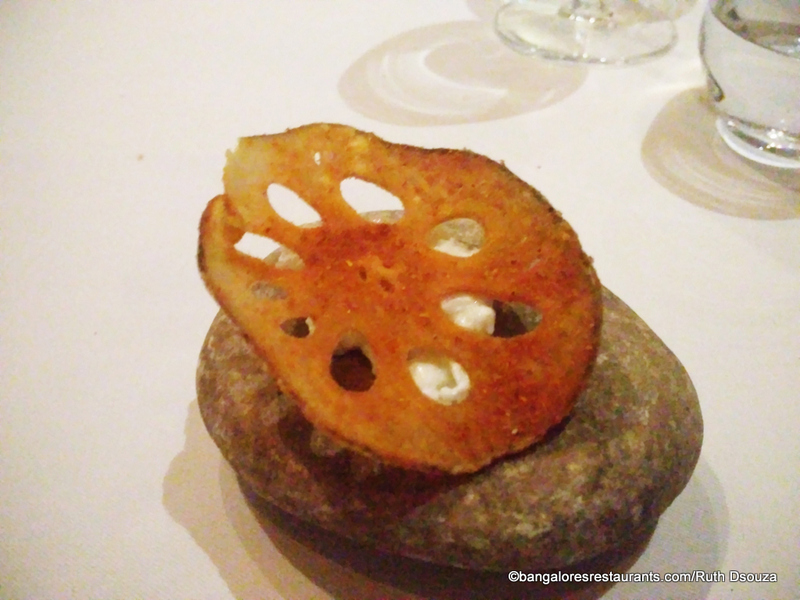 The same dish takes on a pureed for, with a glaze of a mint chutney and then, (I believed it only when I put it in my mouth), the same dish was converted into a crisp dehydrated version. It has to be eaten to be believed. This was a dish that I was waiting for from the minute I read it on the menu. 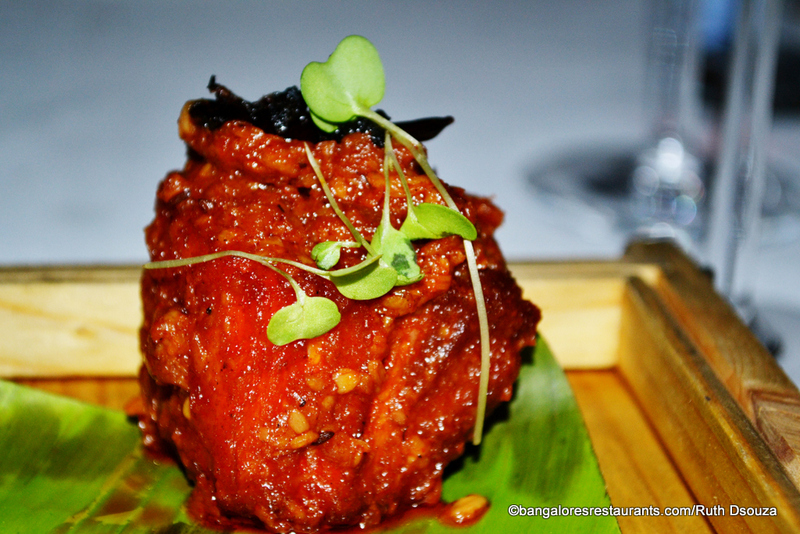 I have always been a fan of Northeastern food and this Naga Pork was a great representation. The piece of pork belly came with braised black beans and bamboo shoots. What took it to the next level was that it was smoked with Bhoot Jholokia. This is one dish that had all my favourite ingredients and one that came together so well. Rather than have the bhoot jholokia overwhelm, that subtle touch with the smoking is what made it just so good. There are a lot of choices from this point onwards in the meal, yet Karan felt it best that we sample every dish that the menu has to serve and so that is what happened. Next up was the Braised Mutton Champ, Maple and Kokum Glaze - couldn't fathom how maple and kokum glaze would go together, but the balance in terms of sweet stickiness from the maple and the slight tanginess from the kokum gave the slow cooked meat some great nuances to think back on. Tawa Kheema with pickled Bitter gourd - now here was a vegetable I abhor, but the pickling and the small flecks of pickled gourd mixed with a great tawa kheema made it something that I wouldn't mind trying, though in small batches. It will take a while for bitter gourd to grow on me, but hey, I recently converted to coffee, so you can never say! 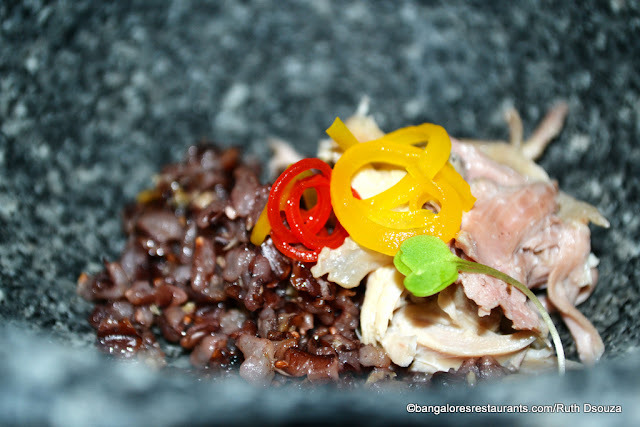 Representative of the Northeast was the Mizo Stew with black rice and chicken. I have loved all things Northeast - from their fermentation techniques to their pickling and the use of indigenous herbs in all of their cooking. All of that, never more so evident than in this dish. 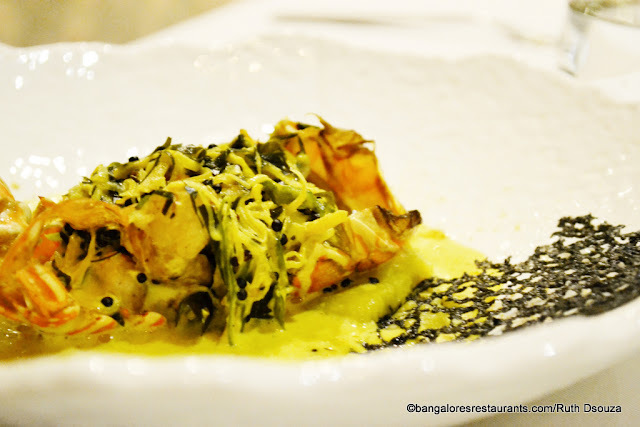 Langoustine Moilee, gunpowder mash, curry and bread - With a Kerala bred husband and of course the Mangalorean heritage a moilee is not a stranger in our home. This one was creamy, has a depth of flavour and did scream of the extensive green coastlines of God's Own Country. And the really fresh lobster, cracked and all beckoning added to the happiness. 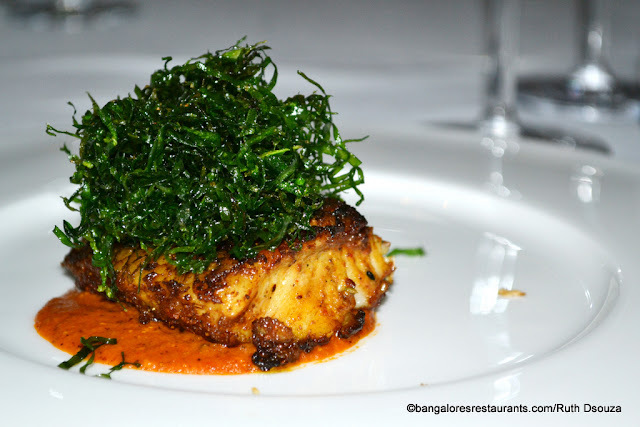 Next up was the Radhuni Sea Bass with pui saag - The robust fish in a classic celery seed preparation made all the more delicious crisp cracking pui saag it is topped over. If we were giving out any signs of us about to split at the seams, well, it was not taken! 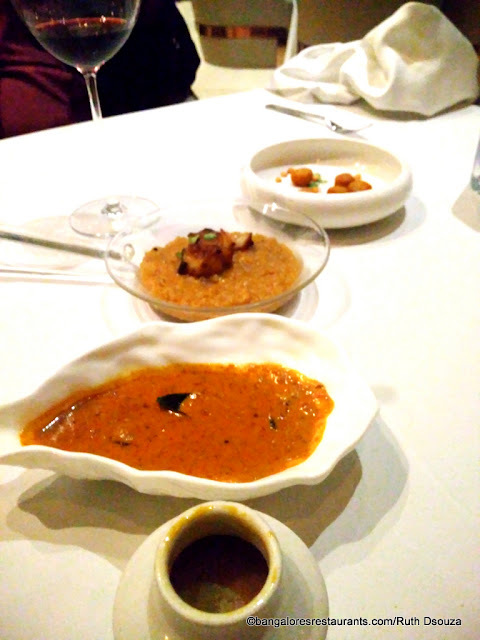 Up next came the Trio of Dals and I happily took a spoon to each one. I seem to have developed this knack of miraculously developing some space when you just can't say no! Dessert was served up with a Sula Late Harvest Chenin Blanc which I was trying for the first time surprisingly - though a sweet wine, much milder than some of the others I have had. A good choice again with the desserts that came our way. This video is of the first spectacular dessert that came our way - truffles presented on suspended magnets! A little nitrogen, a little freezing, some super-conductor magic and voila, you eat truffles off suspended magnets, one of which even rotates! 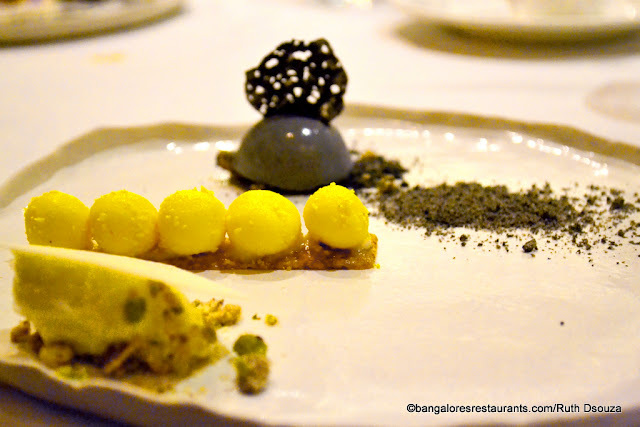 We also had interesting renditions (in terms of presentation of Bhappa Doi, Chenna Payesh and Ashen Kulfi - I actually partied on the ashen dust and loved everything else off the platter. For a non-dessert lover, this is saying a lot. 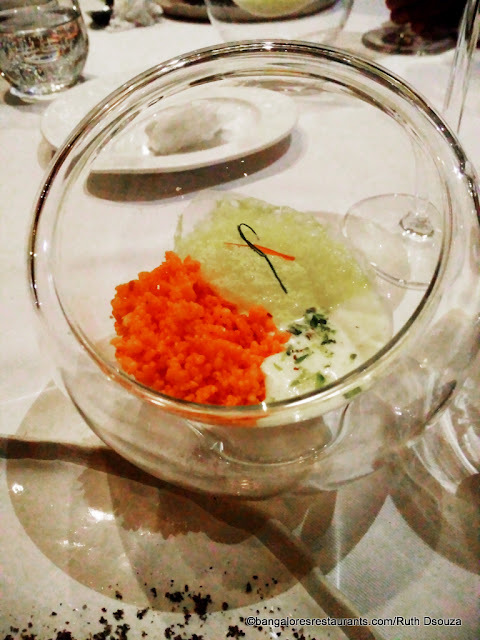 And finally the Jalebi Caviar with Rabdi - crisp, boondi-like texture to the caviar with a sinfully indulgent rabdi spelt the end of this spectacular meal. What was supposed to be a 19 course meal spread out to much more thanks to Karan wanting us to try it all! I am so glad I did. 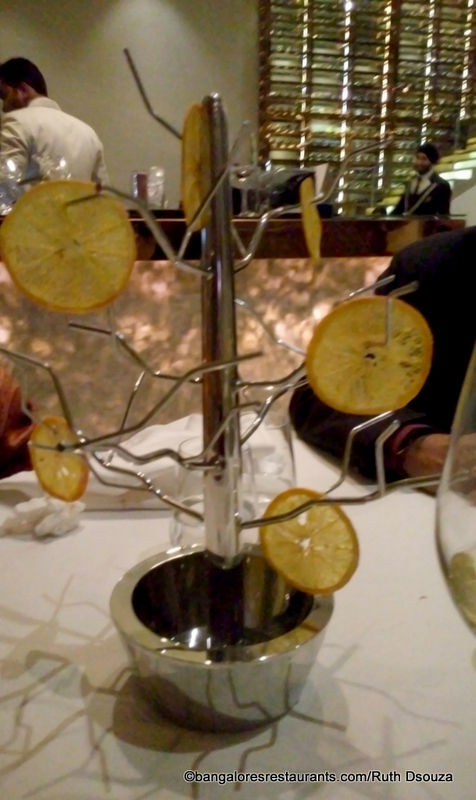 As we sat back to take it all in and rest our tummies before heading home, the Orange Tree came our way- Candied orange peel that I sucked and chewed on all the way! 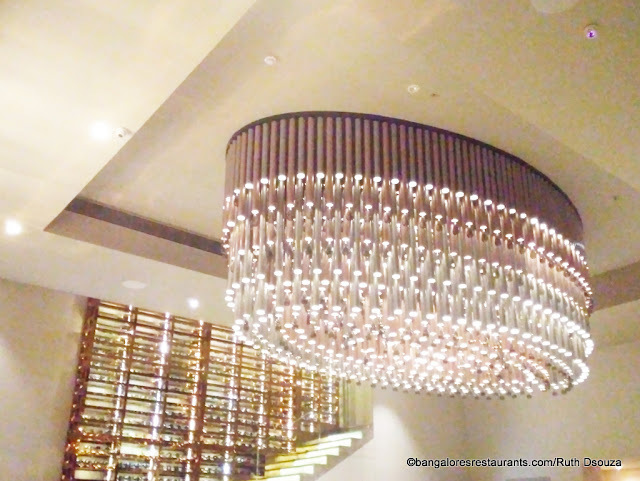 Masala Library was truly an experience and one that does not break the bank at all. This 19 course degustation / Chef's Tasting menu was priced at Rs 2500++ per person. 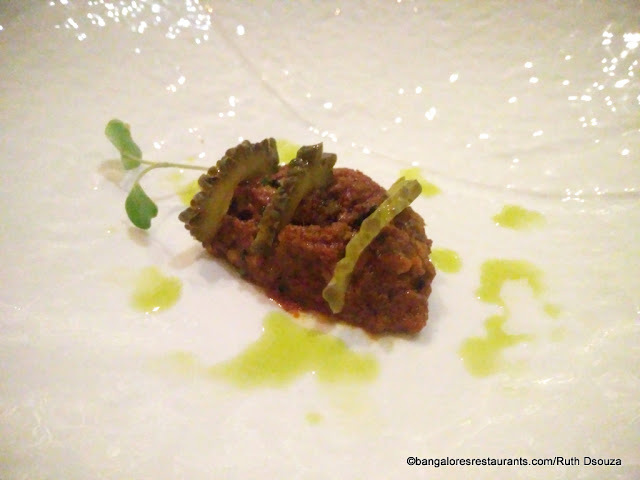 You can upgrade to a six wine paired menu for an additional Rs 2300++, which is seriously a fantastic idea. The experience is truly representative of the diversity that India has to offer. All of it served up on a plate that may look extremely modern, but which does not take away from original flavours. 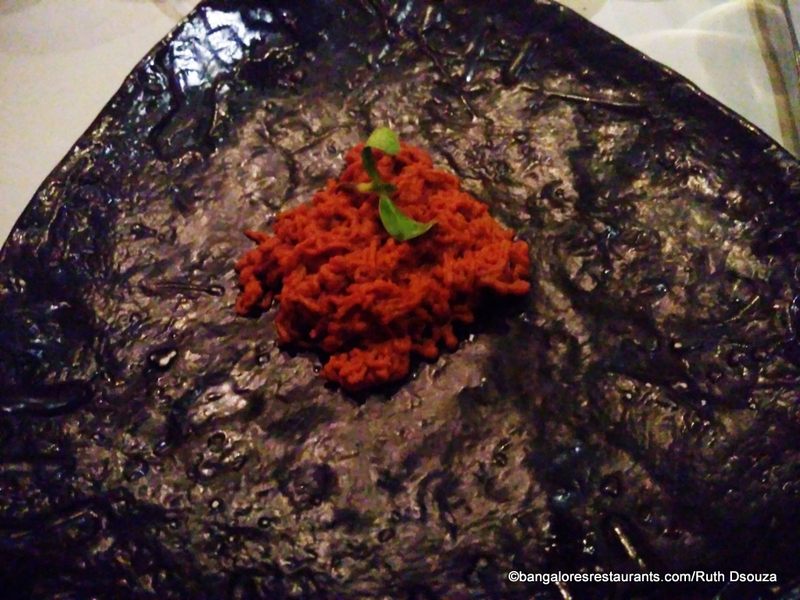 In fact, in a recent interaction with Chef Atul Kochhar who was visiting Bangalore for a pop-up of his restaurants, he mentioned to me that Masala Library has elevated Indian food and presented it for what it really is - toning down on the excessive use of technique and letting the core ingredient do all the talking. I definitely agree with him. Karan mentioned that the menu was going to undergo a revamp soon and the degustation menu would feature all things new... another visit on the cards for me? Hell Yeah!